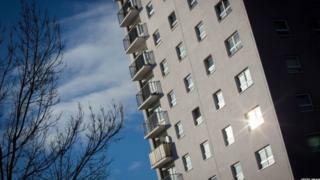 Plans to protect leaseholders and tenants in England from unfair costs have been outlined by ministers. They say they want to clamp down on a "small minority of rogue agents" in the property management system who force consumers to pay over-inflated service charges and other fees. They will consider changing the law so all letting and management agents must be qualified and regulated to practise. Labour said the proposals were "feeble" and changes in the law were needed. In a speech on Wednesday, Communities Secretary Sajid Javid launched a six-week "call for evidence", saying he wanted to hear from people about whether a regulatory overhaul of the sector was needed. He pledged to protect consumers from unfair costs and excessive service charges and look at ways to place more power in the hands of consumers by giving leaseholders more say over their agent. The review will also examine if a new independent regulatory body is needed - and if separate bodies should be established, for both leasehold and private rented management, and letting agents. Other measures to be considered include whether leaseholder tenants should have a greater say over the appointment of managing agents and how transparency can be increased in the system so that tenants and leaseholders know what they are being charged for and why. "Our proposed changes to regulate the industry will give landlords, renters and leaseholders the confidence they need to know that their agents must comply with the rules," Mr Javid said. Between £2.5bn and £3.5bn a year in service charges are levied on the 4.2 million leasehold homes in England. Consumer group Which? has said its research has suggested up to £700m of these costs are unnecessary while the All-Party Parliamentary Group on leaseholds, believe the total could be as much as £1.4bn. Ministers say the problems apply not just to leaseholders but also some of the 4.5 million tenants in the rental sector, with overcharged costs for repairs and services often being passed down to tenants. Housing minister Alok Sharma said there were reports of broken windows being repaired with cardboard, mould being painted over and a landlord being billed £500 by his agent for repairing a shower door. But his Labour counterpart John Healey said the measures did not go nearly far enough. "In the face of the country's housing crisis, this is a truly feeble announcement," he said. "It isn't even a commitment to act, it's a commitment to ask some questions." The Association for Residential Letting Agents said it would support greater regulation of the sector to drive out the minority of operators giving the industry a "bad name". "It will give consumers greater control over who manages their property, create long needed transparency, and raise the bar for those wishing to work in the housing sector," said its chief executive David Cox. "Blanket regulation is the right approach if we are to give consumers the confidence they deserve and reassurance that they will be treated fairly, no matter which agent they use."